We, as a prominent Manufacturer, Supplier and Exporter, bring forth 3 Trays Floor Display Stand. It is manufactured using firstclass raw material ensuring its durability and longer life. Our team of experienced professional takes care of the designing and fabrication. We leave no stone unturned to ensure that we match the various parameters and standards set by the industry. It is available in different customized specifications as per the request of the customer at economical rates. Finish - Glossy/Matte Film Lamination, Varnish Coating, UV Coating, Oil Lamination, etc. MOQ - Any quantity is available. Payment - T/T, Western Union, Paypal. Payment Term - 40% deposit, balance before shipment. 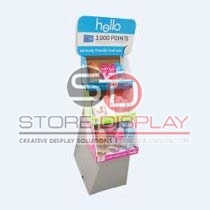 Looking for 3 Trays Floor Display Stand?